French Talmudist of the first half of the thirteenth century. His name occurs in a manuscript in the British Museum collection of commentaries on the Pentateuch (MS. Brit. Mus. Add. No. 22,092; see Geiger's "Jüd. Zeit." ix. 231). Gross takes him to be a son of Solomon of Dreux, in the present department of Eure-et-Loire, and identical with the Bible commentator Joseph of (which is a misspelling of = "Dreux"), who is mentioned in a manuscript of "Minḥat Yehudah" (Renan-Neubauer, "Les Rabbins Français," p. 441). 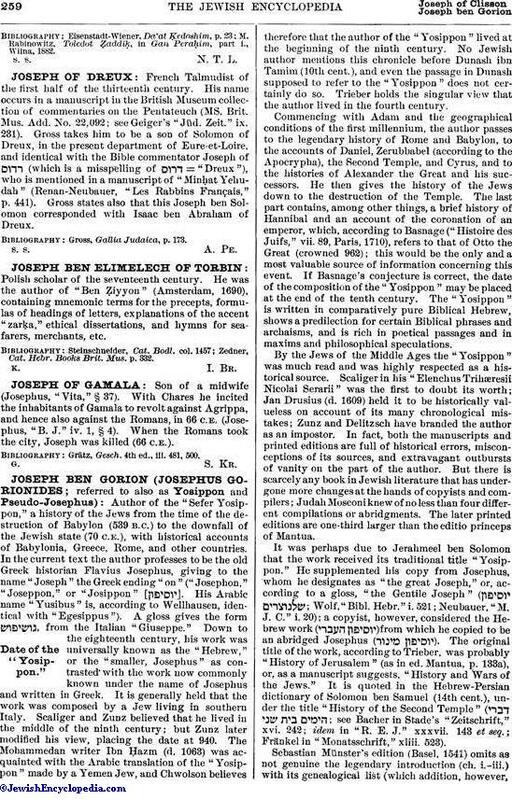 Gross states also that this Joseph ben Solomon corresponded with Isaac ben Abraham of Dreux. Gross, Gallia Judaica, p. 173.